On 25 May, Africa Day offered us the occasion to celebrate Pan-Africanism, take stock of what is happening in our great continent, and to ask ourselves in what direction we are going. And that, in turn, begs the question: How is the African Union (AU), under its new leadership, going to take us there? The AU’s first six years have been challenging. Launched in Durban in 2002, the AU was to be the torchbearer for the new Africa—young, dynamic, and committed to Pan-Africanism. Africa demanded change, and the AU was tasked with delivering it. The Constitutive Act of the African Union imposed the highest standards on the continent’s leaders. Unconstitutional changes in government were prohibited. Article 4, specifically, mandated intervention in cases of humanitarian crisis or grave human rights abuses, and thus ushered in a new era in which Africa would act decisively to solve African problems. In that bright dawn of the African renaissance, there was a vigorous debate about the new Africa. The idea of uniting the continent captivated many people. The potential for freedom of movement, integration of economies, curbing of corruption, the creation of continental institutions such as the Pan-African Parliament all inspired a hope among many for positive change. The New Partnership for Africa’s Development (NEPAD) held out the promise of accelerating growth. The flame burnt brightly with the leaders that Africa chose: a principled, elected Pan-Africanist, Thabo Mbeki, as the first President; and a former democratic head of state, Oumer Alpha Konaré, as the first fully-constituted AU chairperson. 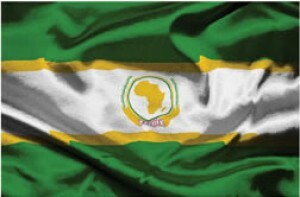 The AU adopted “Change” as its slogan. Today the charismatic son of Africa, Barack Obama, has galvanized a generation of young American voters with the promise that “we are the change.” America is showing the world its inexhaustible capacity to regenerate itself, to tap the energy of the young and to recreate itself. Africa is a much younger continent — half of our people are twenty or younger — and our youth are an ever-creative fount of new ideas. We have to ask, though, where are they among the ranks of Africa’s leaders and officials? At the birth of the AU just six years ago, the promise of change burned brightly. Today that torch is flickering. The promise has not been kept. At the AU summit three months ago, the assembled heads of state were faced with the challenge of picking a new Chairperson to lead Africa’s premier institution. The man or woman they chose would be the most senior civil servant in the continent. They needed to choose an individual whose leadership would shape the future of the AU. Africa needed a new face, with energy and a steadfast commitment. That was an opportunity for a continent-wide debate. There should have been a vigorous debate among African leaders and opinion-makers about the person to lead the AU. Ordinary people across the length and breadth of Africa should have been consulted. What do they expect from the AU? How can the AU be in the forefront in the creation of a new Africa? Should it continue to take on peacekeeping challenges, as in Darfur and Somalia, or should it hand these responsibilities to the UN and focus on the politics of conflict prevention and management? How is the AU to be administered? Does it need another charismatic leader, or should it instead choose a technocrat who can put in place the administrative and financial systems necessary for the institution to grow? That debate never happened. No campaigns formed around these issues; and Africa missed a critical opportunity for rejuvenation. The ageing leadership, among them many devoted pan-Africanists, fought long and hard for the liberation of the continent. Many of them were young when they embarked on the struggle. The independence generation of African leaders, today revered for their vision, were young men in their thirties and early forties and sometimes younger. Yet today there is no readiness to hand the baton to the new generation. No doubt, the pan-African challenges today are very different from those of thirty years ago. When the AU set up its ‘Panel of the Wise,’ a group of distinguished citizens to promote efforts to prevent conflict, it simply assumed that the wise had to be old. What about the youth? When mediators are chosen to lead efforts to settle Africa’s conflicts, the AU automatically looks to the ranks of superannuated diplomats. Many of them are good. Today’s causes of conflicts, however, are not the same as those of the past, and the leaders who are fighting—especially the rebels—usually are thirty or forty years younger than the men (and they are almost always men) appointed to gain their trust, understand their aspirations, and lead them to peace. Our political systems seem expressly designed to exclude the bristling energy of the youth. Africans have been galvanized by the on-going U.S. presidential campaign for two reasons; first because it matters a great deal to Africa who leads America, and secondly, because one of our own is enthusing voters of all ages and ethnic groups with the promise of change. Where is the comparable campaign here? Where is the African Obama? Why do African political systems end up recycling the same old faces? Why does every election on the continent seem preordained to end in a deal between the same old elites, where the people’s choice is regarded as no better than a distracting nuisance? Is it possible that young people find the political atmosphere stifling and alienating? The AU is a great and noble institution. History teaches us, however, that those organizations which refuse to adapt and innovate stagnate and die. Ultimately, the quality of the AU’s leadership will best be shown by its readiness to bring younger people into senior positions at the AU Commission so that the new generation can at last participate in the decision making process in a meaningful way. The people of Africa deserve nothing less. Abdul Mohammed is a peace activist based in East Africa. He works on a wide range of development issues including refugee resettlement; relief and emergency, and food security programs.